Impurities in the water are removed through a process of coagulation, filtration, and chlorination. Coagulation involves mixing floc into the water to absorb suspended particles. 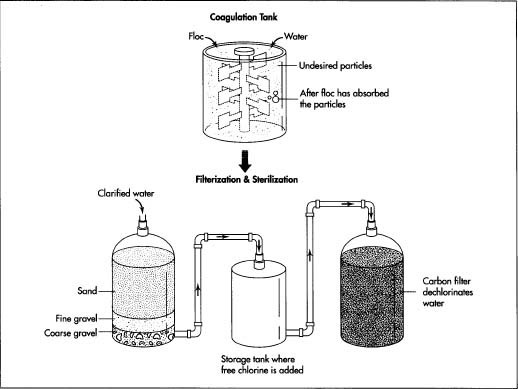 The water is then poured through a sand filter to remove fine particles of Roc. To sterilize the water, small amounts of chlorine are added to the water and filtered out. tank for about two hours until the reaction is complete. Normally, the to measure content on CO2 inside the sofdrink, pleople use as GAS VOLUME. How do you calculate yhe gas volume say for Coca Cola ? nice info... just 1 question... what gas is in soft drink? also... answer to my email plz... thnx and what soft drink has the most gas? have only bad effects in our health??...thanks! "sodium bicarbonate & water mixed with ACID"
what ACID do you refer? I am an aspiring entreprenuer interested in getting into the soft drinks business specifically as a manufacturer. What tools and ingredients would i need to start inexpensively? How can i do this from home? Is it possible? 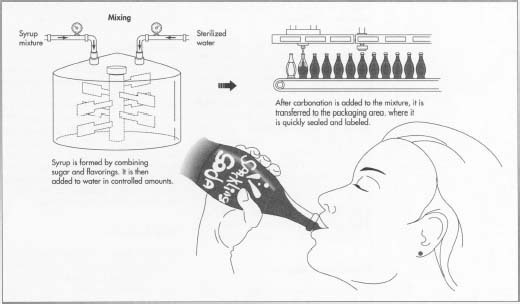 I cannot seem to find any information on NON carbonated processes as many soft drinks are not carbonated. Then there are the drink crystals that one adds sugar to at home etc. I cannot find any details on how these packets are made anywhere namely because when one looks it up it says "Add a cup of sugar to a packet of the stuff" and this is how it is made. I want to know how the powders are made, are they from dehydrated fruits etc. Any suggestions? what is the best to use in producing soft drink, is it citric acid or malic acid in order to get an extra bite and strong mouth feel bite while drinking a soft drink ? all what explained above is good , but what is the flavor that shall be added to give a strong bite in mouth and to help co2 to keep strong for long time after open pet bottel ? dose adding cream soda will give a foum ? & which type of cream soda to add ? dose cream soda can be easly filled or shall be used anitfoum to fill by filler ? what is process soft drink making.pls reply.I WANT TO KNOW THAT MAKI OF SOFT DRINK AND ITS MATERIAL. how to use potassium carbonate for using soft drinks and how much is the percentage of water we are making juice items like grapes, oranges.strawberry etc. we make fruits only in the make of essence and not fruits pls guide me how to prepare thanking you for your valued reply.